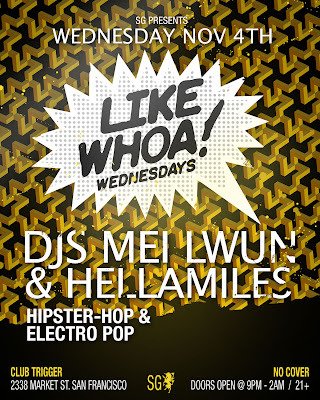 SG presents "LIKE WHOA" Wednesdays San Francisco's new mixed bag mid week for a mixed crowd party welcomes Dj HELLAMILES a hecka talented kid with a musical selection and tastes beyond his years. Triggers plush atmosphere, thumping sound and Upper Market location will make this your new favorite weekly. Remember $5 Fernet and a Budweiser and $100 Absolute bottles and reserved tables. Call the club for your reservation.